While we love our Western North Carolina mountains, we can’t hep but get excited about filming and producing video for companies in Greenville. We’ve recently expanded our production service to include the Greenville market and we couldn’t be more thrilled. It’s a beautiful southern town bursting with charm and industry. It’s hard to ignore the fact that Greenville is growing at rapid rates with more young professionals choosing to call the town home every year. Hospitals, education systems, small businesses and international corporations all recognize what Greenville has to offer, which is why they choose to locate there. To get a better idea about our portfolio, check out our Asheville Video Production page or take a stroll through out portfolio pages. We have experience filming global manufacturing companies like Smith Systems, extensive communities like Reems Creek, and small businesses like High Country Tree Service. You can’t forget about our award-winning camp videos either! This shot was taken while filming a video for the proposed Ecusta Trail. 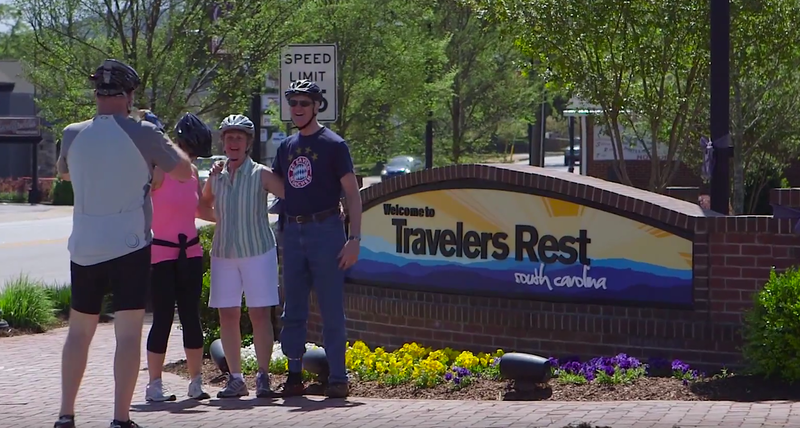 We shot footage of the Swamp Rabbit Trail and Travelers Rest Mayor Wayne McCall for the project.